Bartzan and the Ancient Forbidden Golden City of Gold! 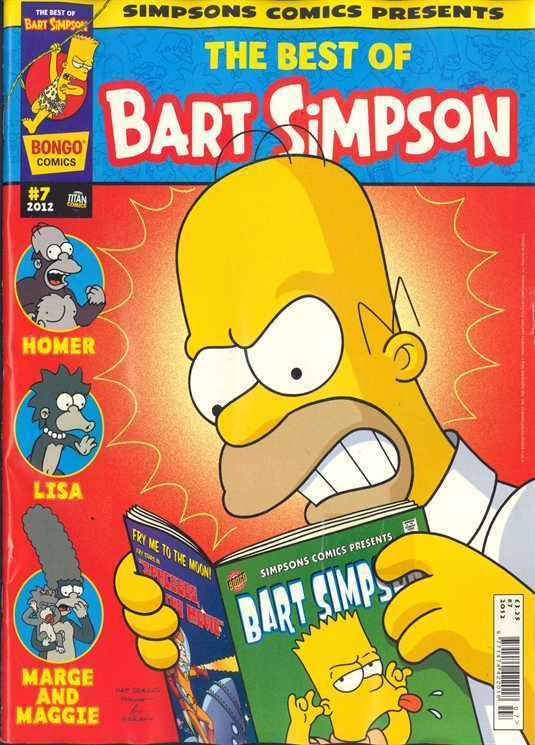 The Best of Bart Simpson #7 is the 7th issue of The Best of Bart Simpson. It was released in November 8, 2012. 1.1 Bartzan and the Ancient Forbidden Golden City of Gold! 1.8 Bart Does Something Fishy! Main article: Bartzan and the Ancient Forbidden Golden City of Gold! Bartzan saves the life of a young woman whose father is an explorer. It's Little Buddy Day at Springfield Elementary School, the day when the older students should help the younger students. Bart and Milhouse take Lisa with them to watching a horror movie. Bart is to give a speech to the students at the school but just before he gets up on the stage he wets his pants. Main article: The Time Bandit! Lisa tells to Bart that in three days, it's Mom and Dad's anniversary day, Bart remember what she gave them last year and intend to beat her this year. He goes to Professor Frink to collect money for a gift and employees as a cleaner. He begins to clean up his time machine and accidentally start the machine, and they both gone back in the time. It's "Bring Your Parents to School Day" at Springfield Elementary. As the day goes by, Bart is increasingly embarrassed by Homer's oafish behavior, but reaps an unexpected benefit from it. In the school's computer lab, Bart becomes bored with his research project and asks Martin to help him get to some cool websites. Main article: Bart Does Something Fishy! After Homer destroyed the interior of The Frying Dutchman, Bart must pay for the damage. Lisa's family reading night doesn't go to plan when Homer forgets his book (leading to him reading his beer bottle's label) and Bart reading "The Cat Wears A Hat" (a book at first grade reading level). Lisa gives in and decides to turn on the TV and, to the family's annoyance, puts on subtitles and turns the volume of, forcing them to read. The strip ends with Krusty noting that these views are Lisa's and do not reflect Krustylu Studios views and that you should watch plenty of TV. Modified on July 24, 2017, at 10:08.